This book got a lot of hype, and while I was weary of that, overall I thought it was justified. FOR YEARS I've been searching for a book that ranks you by your intelligence- it seems to me like it would be humanity's natural course. I mean, isn't that the ruling factor now? Who are the billionaires? Creators of software, social network sites, apps and gadgets. Basically, I was so happy to read about that system, and thought it was very well done. 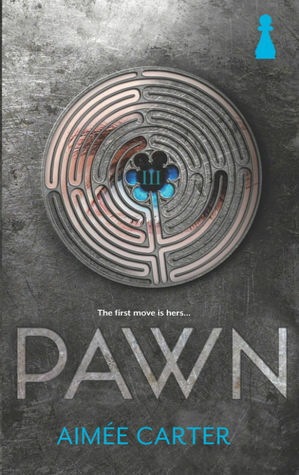 Another aspect I liked about Pawn was that the story was VERY character driven- wasn't a bunch of random stuff thrown at a group of people. Their decisions and actions propelled the plot. And there were a lot of those! I was surprised and thrown off at every corner. Speaking of characters- I have to say that I loved them, but I didn't feel we, as readers, were able to fully understand them. By the end of the book, I was thoroughly inthralled by them but still had no idea what made them tick. For that alone I look forward to the sequel. Now for my nitpick: After the big finale, if you will, or the climax, the correct course of action seemed really obvious to me and I think it will be to a lot of readers. Without spoiling anything, I'll just say they should have exposed the whole thing! There was nothing to stop them. Instead the author chose to stretch out the main conflict for another book, totally unnecessarily. I WILL read it, because I did really enjoy this one, but it'll really have to get complicated IN A WAY THAT MAKES SENSE (I'm referring to countless spin-offs that generally throw some problem out of the blue that in real life would probably not happen. *coughs* Sebastian coming back from the dead) . My goal last December when I just started out as to reach 100 GFC followers by the end of 2013. Almost there!! Care to help me?